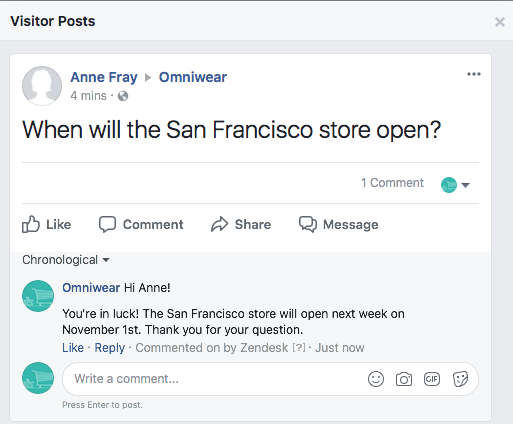 The Zendesk Facebook channel lets customers make support requests using Facebook. It also lets your agents see and respond to customer Wall posts and comments from within your Zendesk. The Facebook channel supports Facebook Pages, which are different from personal timelines. Facebook Pages help businesses, organizations, and brands share their stories and connect with people. See this Facebook article to learn more about the differences. You can create and manage a Facebook Page from your personal account. You can add up to fifteen Facebook Pages to the Facebook channel. You have to be an administrator or have appropriate role permissions to set up the Facebook channel in Zendesk. Tip: Fine Tuning: Learn how to maximize social media support with Lisa Muccigrosso's Fine tuning: How to provide great support through social media. After setting up your Facebook channel, your Zendesk monitors your organization's Facebook Page. Every new Wall post or direct message automatically becomes a Zendesk Support ticket. If the posting user is not already a user in your Zendesk, he or she becomes a new user in your Zendesk. If your channel has multiple Facebook pages and a new user posts on more than one page, a separate user account is created for each page on which that user posts. If you would like comments to be added as new tickets, you can enable the Comments as Tickets feature under Admin > Channels > Facebook > Edit. Replies to that comment are then added to the created ticket. An agent working in Zendesk can respond to a Wall post by adding a public comment to the ticket in Zendesk Support. The agent's response is added as a comment to the Facebook post. 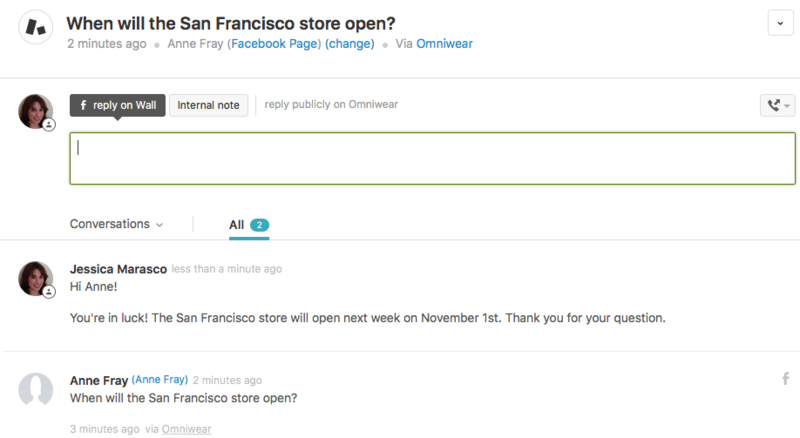 In the following Wall post, for example, an agent answered the user's question in the Zendesk Support agent interface. You can set up a view in your Zendesk to see all your Facebook tickets in one place. In addition to automatically converting Wall posts to tickets, you can set up your Facebook channel so that private messages sent to the Facebook Page become tickets. This means that a user can ask a private question, and an agent can have a one-on-one conversation with the user. Users click the Message button on your Facebook Page to send a private message. Facebook limits how Pages can communicate publicly and privately with users. So, if you receive a ticket from a Wall post, when you reply in the ticket, your response will be added as a comment to that Wall post. And if you receive a ticket from a private message, when you reply in the ticket, your response will be a private message. You cannot respond to a Wall post with a private message in the ticket. And likewise, you cannot respond to a private message with a Wall post in the ticket. Note: Attachments cannot be added to public replies in Facebook tickets, including replies to posts, comments, and direct messages. Click the Admin icon ( ) in the sidebar, then select Channels > Facebook. Enter your Facebook credentials, if you are not already logged in. When asked, be sure you grant Zendesk access to your account. Click Add for the Facebook Page you'd like to link to your Zendesk. If you have multiple Facebook Pages, click Add for another Facebook Page or close the window. The Facebook Page you added appears on your Facebook Channel page. You can edit the settings now, if you'd like. By default, any Wall post is converted to a ticket, including those by the page owner. Click Edit beside the Facebook Page you'd like to edit settings for. In the Include Wall posts section, select No if you don't want Wall posts automatically converted to tickets. Otherwise, leave it as is. Select Comments on a post are added to the same ticket to add responses on Wall posts as replies to the Wall post's ticket. Select Comments on a post create new tickets to add responses on Wall posts as new tickets. Select Include hidden posts to review posts that haven't been approved by the page as tickets in Zendesk Support. Deselect Include Wall posts authored by the Page if you don't want posts by the Facebook Page owner converted to tickets. Select Include unpublished posts to review unpublished posts (also known as dark posts) as tickets in Zendesk Support. This will also allow Facebook ads to convert to tickets. In the Include private messages section, select Yes if you want private messages converted to tickets. Note: If you don't see the Message button on your Facebook Page, you need to enable it. In your Facebook Page, select Manage > Edit Page, then select Show Message button and click Save Changes. 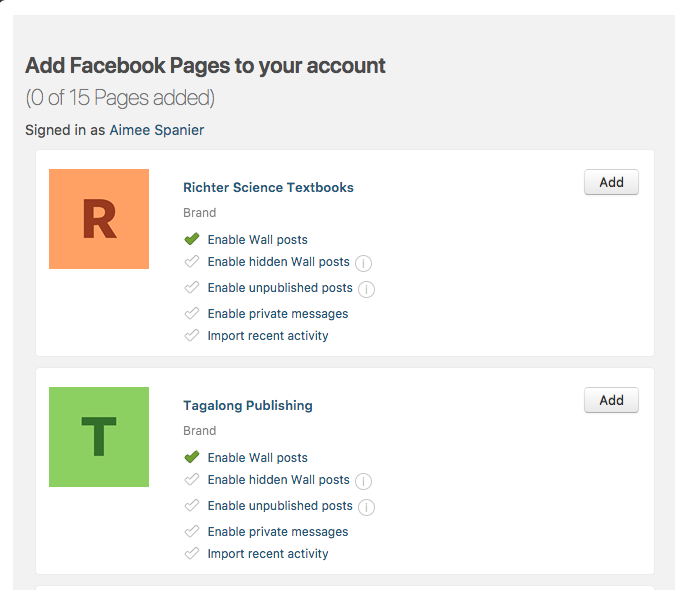 You can monitor up to 15 Facebook Pages from your Zendesk account. Keep in mind that there are still limits that Facebook places on traffic from external sources, so it is possible that your account might make too many requests. This has more to do with how many posts and messages you retrieve than how many pages you enable. Also, keep in mind that if a new user posts on more than one page, a separate user account is created for each page on which that user posts. In the Add Facebook Pages dialog box, select Import recent activity if you want to create tickets from existing messages or posts. Zendesk will import the last week of activity (up to 250 tickets). Click Add beside the Page you'd like to add. The Facebook Page appears in Facebook Channel page. Facebook Post returns tickets created from posts. Facebook Private Message returns tickets created from private messages. Ticket: Integration account lets you pick a specific Facebook account if you’ve added more than one. This condition also has options for Twitter and channel integrations like Google Play. If you need help fixing a problem with your Facebook channel, see Troubleshooting issues with your Facebook channel. Is it only possible to comment on Facebook as my business page itself, when it comes to using tickets, or can I also comment on behalf of my private profile? I have approx 10 Facebook channels up and running and they are all "active pages" but one I have is listed as "not active" and does not work of some reason. I have tried to re-attach it several times same ay I did ith the other ones and also checked all configs insde FB but no sucess, please advice! Is it possible to create a ticket when a New Review has been added? I find this would be a very beneficial feature. Would you be able to clarify what you mean by "new review" and where this would occur in the Facebook channel? At this time, tickets can only be created if they fall under the available options for ticket creation in Facebook listed under the "Editing you Facebook channel." I hope this helps! @Zach Wermich, thank you for your response! I am talking about a business Facebook page. A visitor can leave a review 1-5 stars along with a comment. Our business likes to respond to all reviews in a timely manner especially negative reviews. If there is a way ZD could make a ticket when we receive a Facebook review so that we can respond and address in a timely manner that would be the most helpful thing. Please let me know if you have more questions 😊! This isn't something that our developers are planning to work on as of now, but I'd encourage you to add your detailed use cases to this Product Feedback thread. Providing as much detail as possible really helps our Product Managers when they're deciding what to put on the road map! I have heard that there is a workaround to adding attachments on a Zendesk Public Reply to a FB messenger ticket. A customer can add an image to a FB Messenger post, which does come through to the Zendesk ticket; however, a Public Reply with an attachment does not display in Messenger. My colleague talked to someone but she does not recall the solution. I guess instead of the attachment, the agent could add a link to the attachment, but there are extra steps of storing the attachment, copying the URL, etc. Can you confirm you've created a plain text version of the macro? You can find more information in our Creating Macros for tickets article which I've attached for you. To add a plain text macro you can edit your existing macro and select Include plain text fallback. Unfortunately Facebook does not support Rich Text content so the plain text version will be automatically applied instead. So I just noticed that Facebook has a SPAM folder where some private messages are sent. I am assuming these are from people who have NOT liked our facebook page. I am trying to figure out if there is a way for these to still be sent to our Zendesk? 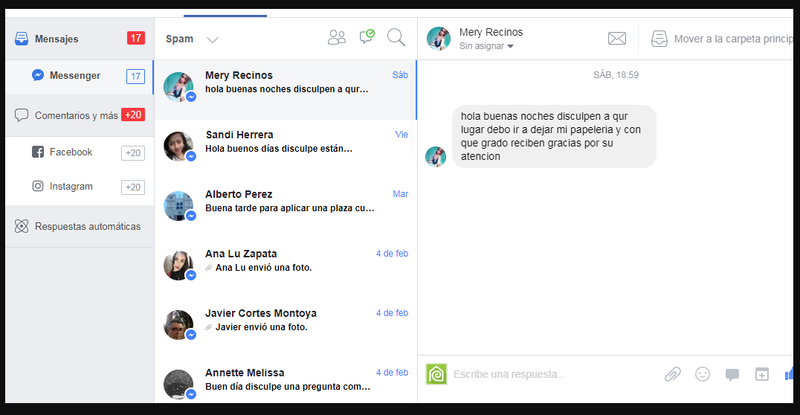 Might not be best place to post - but Facebook message integration - using a macro to respond, it populates into the message " <p> [comment] <p> " - this actually is included when sent, and seen form the customer side of things. We've chosen a setup where every action on Facebook creates a new ticket in Zendesk, so we can keep a complete overview of what we need to respond to, but we're not sure what happens if we "solve" tickets. Zendesk generates a ticket every time our marketing team creates an ad, for instance, but if we solve these tickets do we get a new ticket when a customer leaves a new comment? Generally our concern is if it's okay to solve every ticket in good conscience, when it's handled, or if there's any reason to suspect that when an ad is "solved" or "closed" in Zendesk we won't receive any "follow-up-tickets" afterwards? We'd really like to make sure that we get a kind of "notification" in Zendesk, every time somebody is waiting for a response. We've put everything on "hold" for a long time, but after a while we got thousands of tickets lying around, which isn't sustainable in the long run. What I would recommend doing is creating a view specifically for Facebook posts if you haven't done so already. This will make these tickets easier to track so you can get a response out to your customers in a timely manner. Is your Marketing Team the owner of this Facebook page that you've added? If so, there should be an option to toggle off Include Wall posts authored by the Page so these are no longer generating tickets by navigating to Admin>Channels>Facebook and editing your Facebook page. If you were to solve the ticket, then new comments could re-open the ticket as long as it hasn't be set to a closed status. If the ticket is closed then a new comment would generate a new ticket. However, you'll also want to keep in mind that only comments within the first week of the post creation date will update/create a ticket. Your automation may not look exactly like that depending your workflow but hopefully that gives you a good idea of what you're looking for. We've already set up a specific view in Zendesk for all the tickets generated by various actions on Facebook. I will certainly look into the option about not creating tickets for every ad that is sent out by our team. I'm sure that our marketing team has full ownership of our page. It's pointless for us to generate a lot of tickets that we just close in Zendesk afterwards - only the responses/reactions we get from the customers, after something is posted, are important. And, it sounds like we'll still get these? There's one thing in your response I'm not totally sure about: "only comments within the first week of the post creation date will update/create a ticket". Are we talking about the time from when our marketing team originally posts something on Facebook? I'm not certain if I'm misunderstanding something, but if our posts/ads are "live" for a month, for example, won't every comment be registred in that time, if we've chosen "every action creates a ticket". It's totally fine if a new tickets is created as a "follow-up", if a customer gets back to us after some time, when we've solved the first enquiry. But if it's only gonna happen for a week, it sounds like we should put active ads and posts on "hold" in Zendesk, until our marketing team tells us something has been shut down completely? When I say "only comments within the first week of the post creation date will update/create a ticket", that will only apply for standard posts on your wall. However, if you post an ad to your wall, a ticket is created. Comments are recorded in the ticket for one year after the posting. However, if you close the ticket, comments will no longer be recorded. This is actually referenced in the above article but let me know if that still doesn't make sense. That should hopefully help with the backlog of on-hold tickets you're running into.